Gently massage onto wet skin to form a foam. Rinse thoroughly. Water (Aqua), Cetyl Alcohol, TEA-Lauryl Sulfate, Sodium Cocoyl Isethionate,Glycerin, Acrylates Copolymer, Aloe Barbadensis Leaf Juice, Citric Acid, Panax Ginseng Root Extract,Propylene Glycol, Stearyl Alcohol, Triethanolamine, Butylparaben, Ethylparaben, Isobutylparaben, Methylparaben,Phenoxyethanol, Propylparaben. I thought I would try this product based on a few reviews I read. The product has a terrible smell, very unpleasant. The product leaves my skin feeling great but the smell will put me off purchasing again. Great product, nice texture and good packaging. It could be a bit more perfumed and more refreshing. This face wash is very good leaves your face feeling refreshed and clean. However I have given it 4 stars because the smell isn't great but that does completely ruin it as it is subtle. If only it smelled more like their face scrub. Top delievery time by Mankind AGAIN. The condition of your skin stays the same, but it's clean after use: the only facial wash, that I know of, that's capable of this. This Face Wash is a great product. 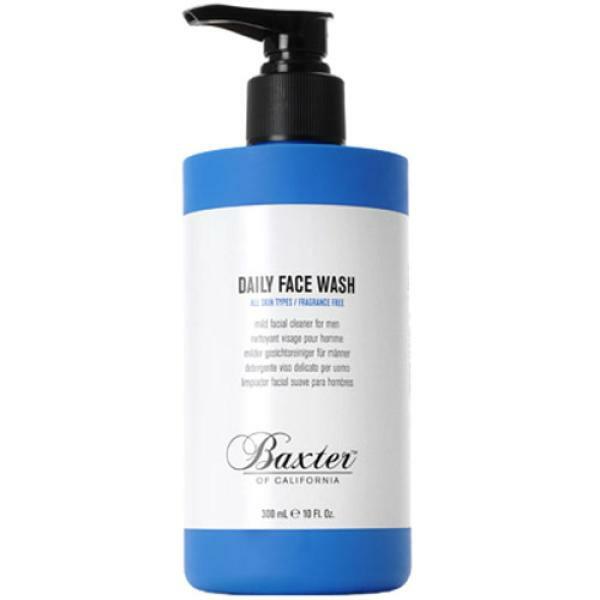 It's one of the best face washes I have used and a large bottle lasts ages. Tried a lot of products over the years, this is by far the best performing and best value. Highly recommended. I have switched from Clinique For Men to Baxters Of California. I have to say this facewash leaves my skin squeaky clean and no oil on my forehead or nose. This is excellent stuff. Great wash, for me deals with the oily areas well and doesn't dry out my skin at all; is gentle plus is cheap. Far better than other more expensive face washes that I've tried. I've been using many Dermalogica products (Dermal Clay, Anti-Bac etc) and found this to be the best of them all. It seems that my skin was reacting badly to the harshness of Dermalogica's Anti-Bac after some time, and my skin has been much happier with Baxter's. If I had to, I could go without a moisturiser with this product, as it really doesn't strip your skin of it's natural moisture, but certainly doesn't leave it oily. Great product. Excellent product, I have very sensitive skin and this does not irritate it in any way. Highly recommended. If Carling made a face wash it would be this one. I have tried many, many different face washes to find one that doesn't cause my skin to feel dry. This product is the best non-drying face wash that I have found. It also cleans very well and great value for money. I'm tempted to try other products from Baxter. V pleased with this, not so bad price, seems to be lasting forever. Very mild on the skin, does not dry out. Only thing I would say is that it does not foam up...but that's no big deal, it is still easy to apply. I have very sensitive skin and have found it hard finding a face wash that does not dry my face. This wash however has done the trick. Very gentle and lasts well. Better than Phytomer Globalpur which I found too drying, also for me it beat REN Balancing Facial Wash, and what a price difference from other cleansers. Works best with mint toner. Great value face wash lasts for ever, you only need a small amount. Smooth's and refreshes! One thing, Baxters, what on EARTH have you done with the packaging, it definitely doesn't sit well with the excellent products! It's a good wash and fairly priced, I took a chance and bought the baxter moisturiser, scrub, and mask; all seem fairly good to me. I would recommend their products - The toning facial scrub is excellent!